I was quite excited seeing lamb kidneys on the menu. Offal is a bit of a weakness with me. These kidneys were tasty and minerally, well cooked and grainy on the outside, moist and tender near the center. Flavoured with 茴香 fennel, 孜然 cumin, garlic, onion and chilli in the typical 新疆 Xinjiang-style. 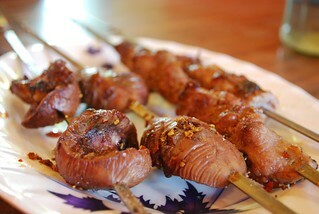 The 新疆羊肉串 lamb skewers also had the same flavours with tender bits of lean lamb cosying up for fatty bits. Not bad, but a bit more heat to give it a more smokey flavour would be nice. It seems Chinatown Dumpling is under new management, this time an 阿凡提 Afanti-branded 清真 Halal eatery. Muslims in China tend to be Uyghurs from Xinjiang. They are well known for their flavoursome take on Chinese food. This didn't disappoint! The signs in the shop window is not coy about their specials, but these dishes served 2 or more people each. No luck for the lone diner.